The last two episodes had been build-up. The episode before last was the thematic build-up, so to speak, the fan-service, giving us all the themes and gags we were expecting. Last episode actually brought us back to Satsuki’s theme of “Pigs in human clothings” and Ragyou’s meta-theme of biblical references, and servitude as power (which contrasts and compares nicely with Satsuki). 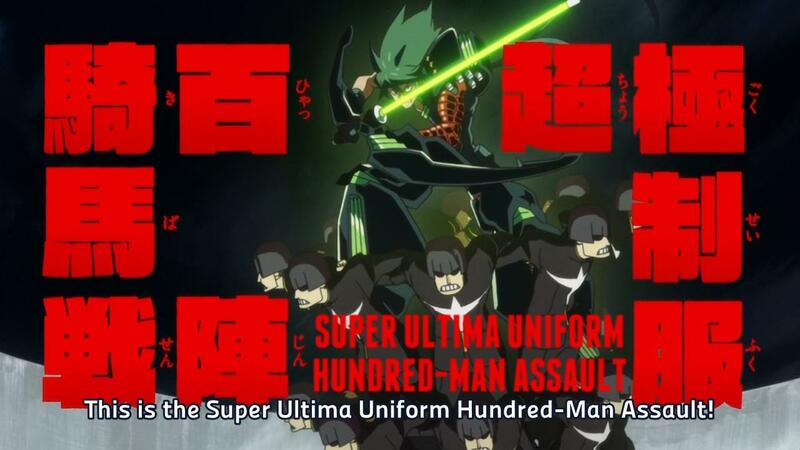 Also, this is a show where everyone is a shounen hero. Ragyou now has had her power-up again, the second since being betrayed by Satsuki. 1) Hundred Men Assault – Sanageyama had always been a gang-leader. Though he, like the other members of the Elite Four are all powerhouses on their own, they are also leaders, they also know the power of working together. Note this shape, he can only get as high as he is because he stands on the shoulders of his comrades (yes, I’m paraphrasing Isaac Newton here). But, some could also consider this a reference to the Tower of Babel, the conceit of thinking you could stand against God. So, another season of anime reached its half-point and it’s time to watch my mid-season impressions, where I talk a bit of the show and rate it. Due to how many shows I have to cover (15), I’ve cut them into two halves, sorted alphabetically. The shows within each episode are sorted roughly by excitement generated within me or how good they are. I’ve also bolded in the following lines what shows I’ll recommend people without reservations. The first post (this one!) will cover: BlazBlue: Alter Memory, Coppelion, Galilei Donna, Gingitsune (Silver Fox), Kill la Kill, Kyoukai no Kanata (Beyond the Boundary), and Kyousougiga (Capital Craze). The second post will cover: Log Horizon, Nagi no Asukara, Outbreak Company, Samurai Flamenco (Samumenco), Strike the Blood, Tokyo Ravens, Unbreakable Machine-Doll, and Valvrave the Liberator’s 2nd season (Kakumeiki Valvrave). To those who don’t know, I avoid reading most online discussion of this show, so the hype and anti-hype and plain old disappointment won’t affect me too much (I try). So, what do I think of it? I think it’s a very interesting show. The clothings as an external power source that runs counter to normal shounen sensibilities where true power must originate from within, and clothing as dignity/humanity had been very real thematic threads in the show’s early episodes, until it came time to shed them as second-hand skin, and to proudly don one’s clothes, and be proud of not wearing one’s clothes… I feel the yarn had got a bit tangled for the writers in that segment, but since it’s early, not every reversed thread must truly find its way into the final tapestry. The source of power still seems a very relevant thread in this tale, and I’ve noticed that not only are the antagonists in this show potential shounen-show characters/allies, but a few of them could even be the stars of a shounen action show in their own right, especially considering what happened in episode 6, where Sanageyama had to show his will for power was greater than everything else, his desire to win, to fight a strong opponent, and maintain his dignity. I’m still curious about all the “Balance of power” talk we’ve had, and hopefully the lessons of Nazi Germany and the George Orwell references in episode 1 (both 1984 and The Animal Farm) wouldn’t just be discarded from here on out. I really wonder what the show could do with more money. The artistic direction and use of stills is brilliant, but it’d be nice to still see it augmented with more money. The musical direction and the choice of classic pieces throughout the episodes greatly enhance the experience of watching this show. Current Grade: A? Some episodes are amazing, some episodes are really good, a couple didn’t hit the mark, and within each episode there are also moments of greatness within an ok episode and weak moments in a good episode. So I’ll give it an A? for now. People often ask me what they should watch if they want to get into anime or have watched only a couple of shows. Obviously, it pays to ask people what genres they like, as anime is just another sub-medium of television and TV, movie and book preferences are all valid. Some of the shows listed here are often noted to be aimed at people who are very knowledgeable about anime, but they are on the list because they stand on their own, and none of us are rookie media consumers. This list is designed in part to present you with a variety of genres, so you could watch these shows in order to have a better place to start from when looking for additional material – based on what you like and don’t like. Future posts will cover movies, and some more shows based on genres and themes. All posts will be organized on this page. Note, unless noted otherwise, episode length is roughly 23-24 minutes, with 3-4 minutes per episode spent on opening song (OP), ending song (ED) and next episode’s preview. 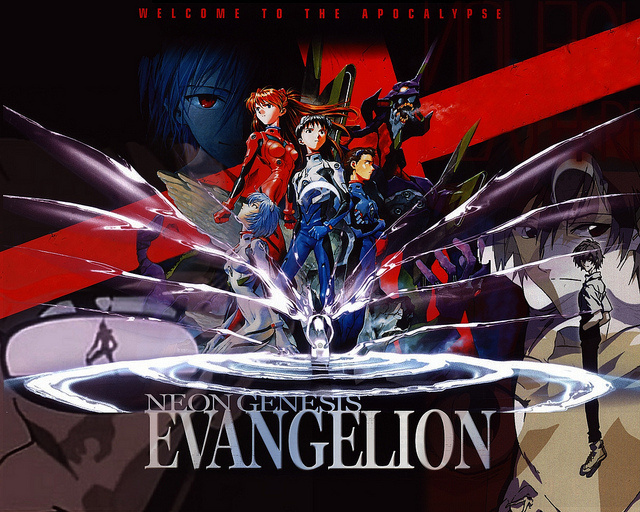 One of the most influential shows of the last two decades on anime, referenced in many other shows, from small cameos to scene composition, to whole motifs being taken wholecloth, aside from the fact Shinji, Asuka and Rei are the archetypes on which countless other main characters had been modeled. That of course isn’t sufficient, but it’s a well told story about a group of teenagers who must risk their lives, relationships and psyche in order to defend humanity. The show begins slowly, but as you go, the emotional hits and the mysteries keep ramping up, until you find yourself with nary a time to take a breather in between. This show had been considered a reconstruction of the mecha genre when it aired, but the story stands well on its own, and with how influential it is I think holding off on watching this show can only be detrimental. The “twist to mystery” which also often includes references to the supernatural and real-world mythologies at times had truly been ever-present in longer shows after NGE. Its effect on the anime world can’t be overstated. Genres and Notes: Action, mecha, psychological, teenagers, mystery. Give it at least until episode 8, where it truly shows you what it has to offer. Watch the main series and then watch End of Evangelion, an alternate ending to the last two episodes. Skip Death and Rebirth as it is entirely superfluous. “Rebuild of Evangelion” (Evangelion 1.11, 2.22, etc.) are an alternate retelling via movies, and aren’t as highly recommended. I don’t suggest this show under the age of 15 – blood, violence, psychological wounds, etc. Often referred to as “NGE” or “Evangelion”. Episode Count: 26 episodes. End of Evangelion is 90 minutes long. Buy on Amazon: The complete series. End of Evangelion had unfortunately been out of print for about a decade now. Well, I’m watching a lot of shows this season, even more than last season, about 20. So I’m going to split this post into two parts, the first will go live today, and the second will likely go live in a couple of days. I will not post this sort of list every week, certainly not for this number of shows. I intend to cut down the amount of shows I’m watching to 10-12 by next week or the week after, to leave me more time for other things. There will be spoilers of episode 1-2 of the shows discussed, but that’s part of the premise, honestly. Shows covered in this part: Coppelion, Nagi no Asukara, Gingitsune, Yuushibu, NouCome, Strike the Blood, BlazBlue: Alter Memory, Tokyo Ravens, Kill la Kill, Outbreak Company. Well, let’s dive straight into it. Again organizing it by how well I like them thus far to make it easier to read. Will also use some keywords to describe each show. Kill la Kill – In case you’ve lived under a rock, this is the hottest show of the season, and perhaps the year. Made by the people who had left Gainax to form Studio Trigger, many of the people behind Tengen Toppa Gurren Lagann are also behind this show, and it shows. Kill la Kill is very sure of what it wants to be, which is a spectacle. Everything is over the top, and we also get some interesting note on the nature of power in the background. Koshimizu Ami who plays the main role of Matoi Ryuuko is an inspired choice, giving the same vibes she did as Kallen in Code Geass. Watch it, it’s fun. Keywords: Popcorn, over-the-top action, fascism, nature of power. Sadly, I can’t cover all the expressions Ryuko has in one photo, especially not her cheeky smile. Month in Review – November 2009: Purchases and Media. Well, it’d please you all to know that while I’m not sure what’s going on with Figure Friday, there will be Figure Monthly rolling out next week, for October, and shortly thereafter November, at the very least. This very entry should have gone up earlier this week, but school is putting the crack down, as well as dealing with the public beta of the Hordes wargame which is currently ongoing. This may or may not be a permanent feature. But since many of the people currently reading this blog did not read this blog when it was new, it’ll be here this time. And don’t worry, we’re going to resume normal postings tomorrow or the day after. Hits: 1,955 hits in August, the first full month of posts. Note, at the beginning of August/end of July, I had 30 hits on the “hot” days, 10 on the rest, and a couple with 1-2, from August 6th or so, I’ve had a minimum of 30 hits per day, and from August 13th, almost all days had over 50 hits per day. I aimed at 500-600 hits total, for the month. Comments: 154 comments in August (including my own). Notable Referers: Note, if your site linked through numerous sites, I can’t see it, can only see the top 40 individual pages who referred. Also, counts some early September data. Wordpress news (I made the fifth comment, mostly “bounces”, one time-visitors): 300. Taikutsu Remedy (Snark’s site): 28. Figure Friday (1): 151 hits. [TIL]: Element Hunters: 122 hits. My Room, July 2009: 116 hits. One more QUESTION before we continue; would you guys be interested in hearing how one can gain a nice level of activity on one’s blog without too much effort (1.5-2k hits a month)? Or do you think you’re all there and it’s superflous? And now, after the “read more” tag, a description of all the last couple of months’ entries. Please check to see if there are entries you’ve missed which you would’ve enjoyed reading. Thank you.